It was the time of joy and gratitude in the house of Maulaatona Faatema (as) when Imaam Husain (as) was born. Jibra’eel (as) conveyed the good news of the birth of Imaam Husain (as) to Rasoolullaah (saws). He was very eager to see the face of Imaam Husain (as) whose birth had glorified and adorned the house of Maulaatona Faatema (as). Birth of Imaam Husain (as) was the cause of joy and happiness coupled with the bitter message of truth of his destiny when Jibra’eel (as) said to Rasoolullaah (saws), ‘O the Prophet of Allaah, your grandson Imaam Husain (as) will be martyred by people of your own ummat in the land of Karbala along with his 72 companions in the state of thirst and hunger.’ Listening to the message of Jibra’eel (as), Rasoolullaah (saws) wept along with Maulaana Ali (as) and Maulaatona Faatema (as). Seeing this, even the Angels of Allaah wept in the Skies. This was the first Majlis of the Azaa of Imaam Husain (as) assembled by the Angels of Allaah on his birth even before the actual martyrdom. Even Ambiyaa (as) wept on the hardships and difficulties of Imaam Husain (as) and his Ahl ul-Bayt (as). When Imaam Husain (as) was martyred on the Day of Aashurah, skies, earth, mountains, trees and every creation wept on the sufferings of their Master. Indeed Imaam is not an Imaam of people but of all the creations. Imaam Ali Zayn ul-Aabedeen (as) and Maulaatona Zainab (as) wept on Imaam Husain (as). They revealed the truth of Karbala at every place they stopped while on the way to Damascus. Even in the palace of Yazeed, they portrayed the whole picture of the Battle of Karbala in the form of Khutbah (lectures), listening to which even the followers of Yazeed started weeping and cursing Yazeed for his evil doings. Azaadari of Imaam Husain (as) is alive even today in the Majlis of Moharram ul-Haram because it is the path of Najaat and Shafaa’at for us because Rasoolullaah (saws) has said that whoever will weep on Imaam Husain (as) will be the inhabitant of the Jannat. Had the Azaadari of Imaam Husain (as) not been there for us, we would have sunk in the grief and sufferings of this World. It is the Azaadari of Imaam Husain (as) which protects and guards us from the sufferings of this World. It was the practice of Imaam Ja’far us-Saadiq (as) to assemble the Majlis of the Azaa of Imaam Husain (as) and he had exclusively called poets of his time to recite the Nawha in the Majlis. The account of Nawha- Khwaani and the Azaa of Imaam Husain (as) is found in the numerous books of Du’aat ul-Akrameen (aq). It is the Ta’seer (feeling, effect) of the month of Moharram ul-Haraam in which the mumineen prepare them for the Azaadari of Imaam Husain (as). 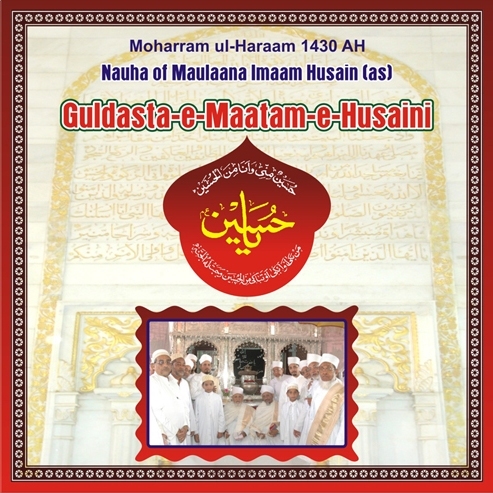 Following the practice of A’imaat-e-Taahereen (as) and Du’aat ul-Mutlaqeen (aq), with the Razaa of Huzoor-e-Aali (tus) we have made a humble attempt to gift the “Guldasta-e-Maatam-e-Husaini” to the mumineen in Moharram ul-Haraam. Mumineen come to Masjid un-Noorani for listening to the Wa’az Mubaarak and Muminaat assemble for the Majlis-e-Imaam Husain (as) in the afternoon. 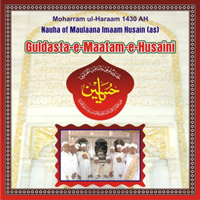 Guldasta-e-Maatam-e-Husaini is the collection of the Nawha of Imaam Husain (as) and Shohadaa-e-Karbala (as) exclusively recorded by the Zaakeraan of Da’wat. We request the mumineen to get the CD of this collection at the earliest and listen to the Noorani collection in their home, shops, factory, cars, computers and mobile phones in these Husaini days. By the Du'a Mubaarak of Huzoor-e-‘Aali Saiyedna wa Maulaana Abu Haatim Taiyeb Ziyauddin saheb (tus), Al-Haadi Deeni Akhbaar is very much pleased to announce the launch of the much awaited Majmoo'ah of the Maatami Nauha in the Zikraa of Shohadaa-e-Karbalaa named “Guldasta-e-Maatam-e-Husaini” on 1st Moharram ul-Haraam. Mumineen will able to get the CD (mp3) along with the Al-Haadi Newsletter. We will also make it available at our office premises. Hadiyah : CD (mp3) : Rs. 44/-.